Abstract. 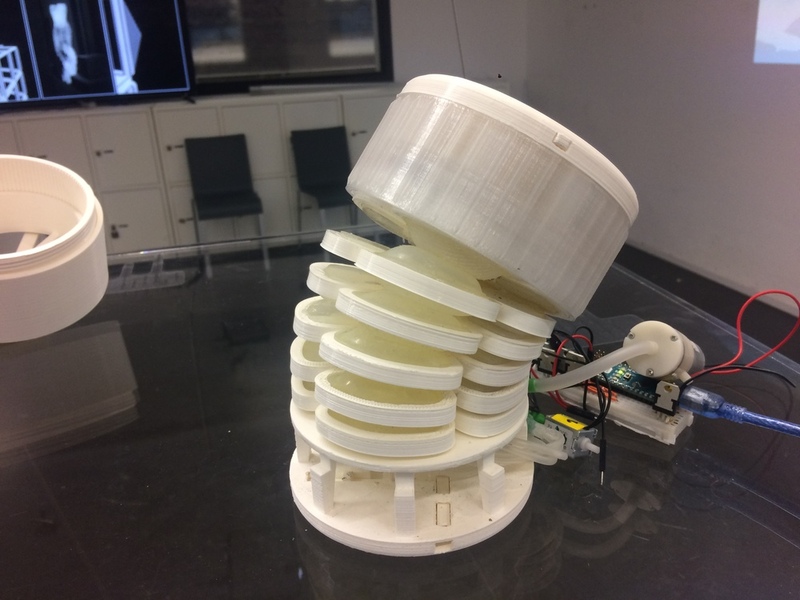 This paper describes a new type of robotic system called MoleMOD. 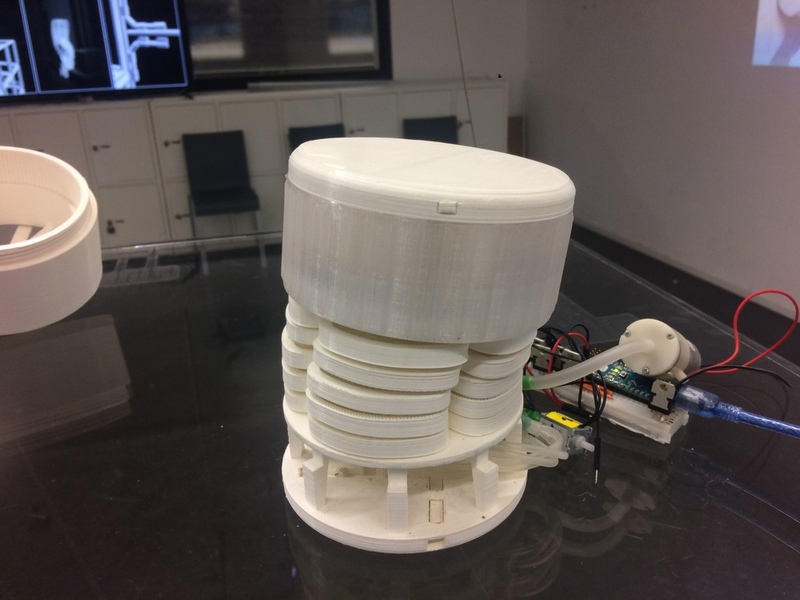 It is basically a modular robotic system (MRS), but contrary to typical MRS there are no mechanical or electronical parts in any module (unit). It consists of passive modular building units and active robots. Different to mobile robotic systems, which it can look like, the robots remove the modules from the inside, not outside as per usual for mobile robotic systems. This system is much cheaper than normal MRS, because the system minimalizes the number of mechanical and electronic parts, but the behaviour is similar and the possibilities of modular buildings are expectedly larger. MoleMOD focuses on architecture, it is a new building system, but it is also ready to be used as a search and rescue system and much more due to its complexity. 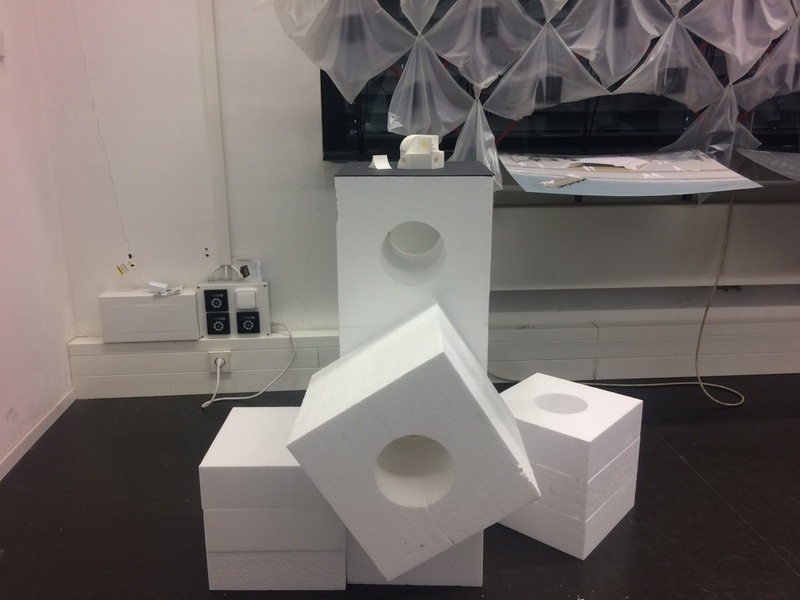 This paper describes possibilities, advantages and applications more than the technical details of the robots and modular building unit, which are still in process. Currently mechanical and IT technologies influence architecture (smart facades, lifts etc.) and due to a growing pressure on precision, adaptation or speed of the building process, the use of the robotic systems is still more popular and often discussed. Quality, precision, timing etc. are influenced by human factors. With automatic robotic systems we could control these aspects better, saving money and time. Contemporary architecture should be different to the way we traditionally think of it. Due to using “new spaces“ like social networks, virtual and augmented reality, it can be very difficult to predict which real physical spaces will be needed. For instance, this paper I can write on many spaces, like the bus, office, park etc. Do I really need physical spaces like an office? Most likely yes, but what size, where, how often? This question evokes that the buildings of the future should be able to be adaptive, moving etc. in the sense of living colonies like termites, ants, bees etc. which constantly adapt their „houses“ to surrounding environments and local conditions. 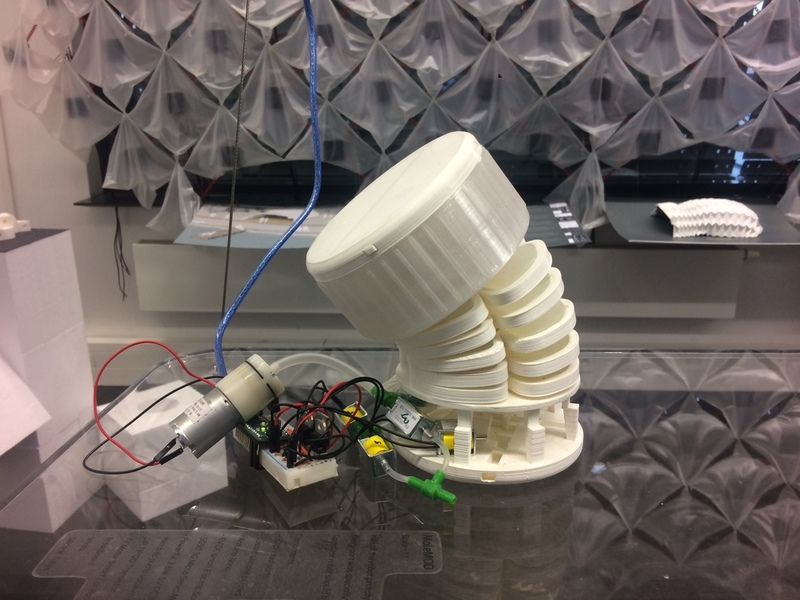 MoleMOD is ready to be adaptive and movable as well as static. Currently I see the main use of autonomous building systems in locations where safety of workers is very low, for example Mars colonization, deserts or polar regions. The site specific construction of MoleMOD is the assembly of active robots and passive modular building units. The robots consist of three parts: a soft body and mechanical heads and rotators. 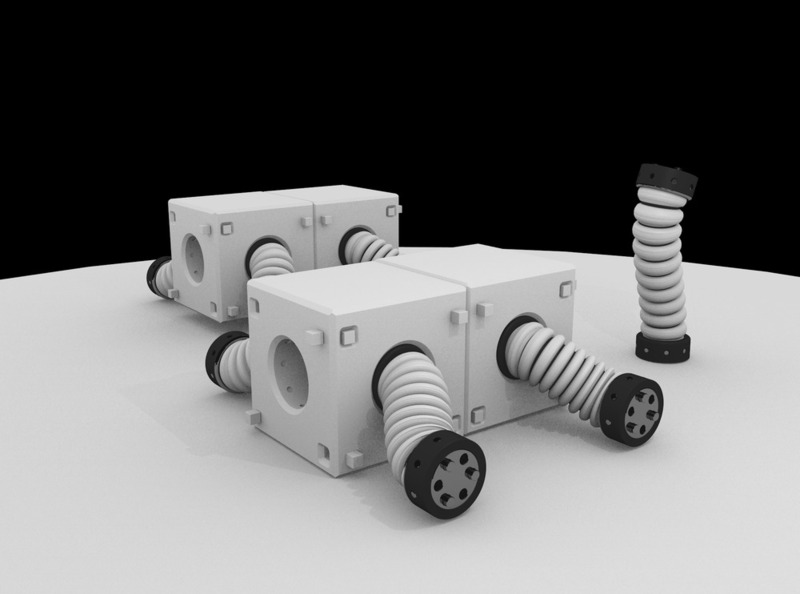 The robots are flexible, rotatable, and able to connect to the passive modules robot as well as pick and ride with modular building units. This system offers extensive possibilities of reconfiguration and adaptation due to separated mobile and modular robotic systems, which are more effective than strictly modular or mobile robotic systems. It is possible to fabricate these units from recycled plastics. Units can be made even of wood, light concrete, carbon, polystyrene, polyurethane etc. The material can vary, because units are passive and they do not have any special mechanical parts embedded. However, the weight of modules is very important, so the lighter material is better after all. The behaviour of the robot gave a name to the whole system, Mole (animal) + MOD (module). The Robot was not inspired by Mole, worm, etc. but it is a result of the developing process, which has passed through several stages to reach the current design. The robot consists of three main parts: a soft body, revolving heads and a rotator in the middle. Each of these specific parts also have a specific function. The head is mainly used for rotating special screws to join the units and the secondary function is to ride, because the head works also as a wheel. The soft body allows precise movement of the whole robot. It is similar to the movement of worms. The Body gives direction to the robot due to its requirements, the secondary function is the manipulation of units. 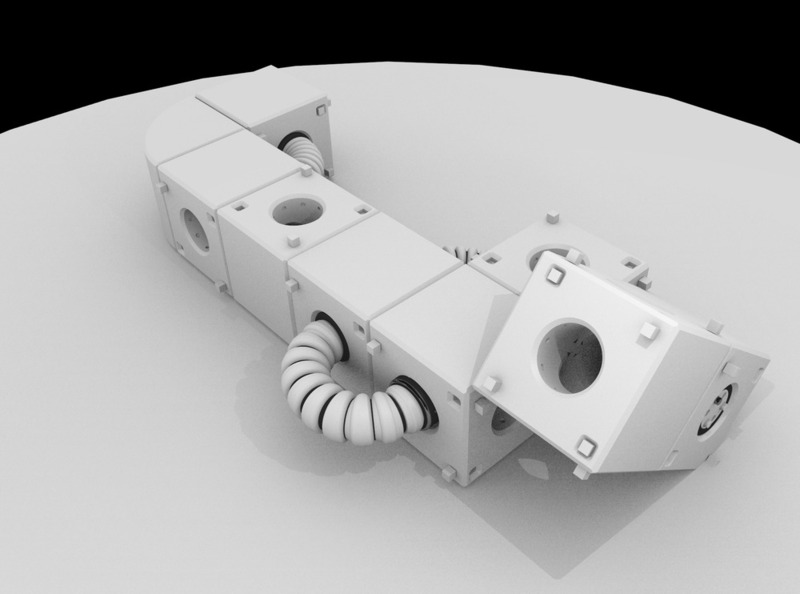 The rotator allows rotation of the units as is typical for classical Modular robotic systems. Circular bottoms include grooves for latches and holders for two motors (servo-motor and stepper motor) and transmission. On the edge are holders for revolving casing. Held parts (motors etc.) are hidden inside of the revolving casing. 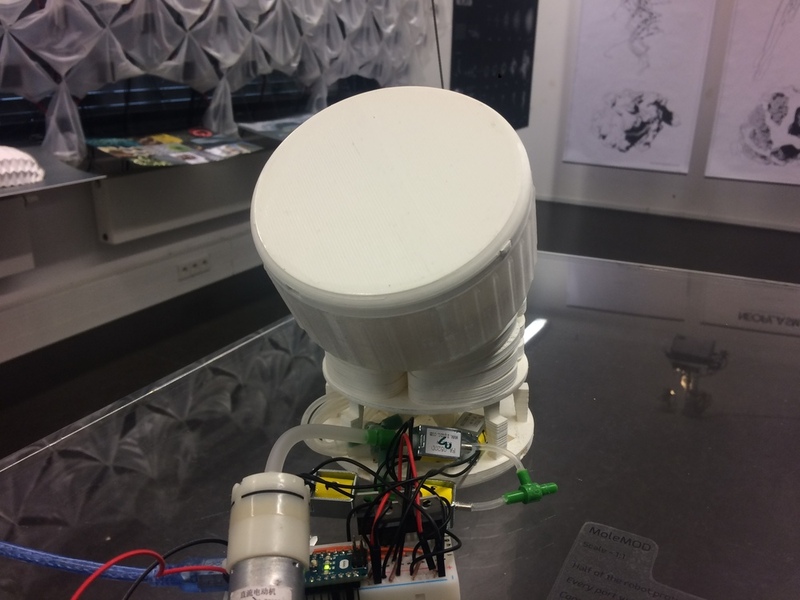 In this volume rests a space for other components which are not installed in this first prototype, like sensors, gyroscopes etc. Revolving casing is main part of the head. 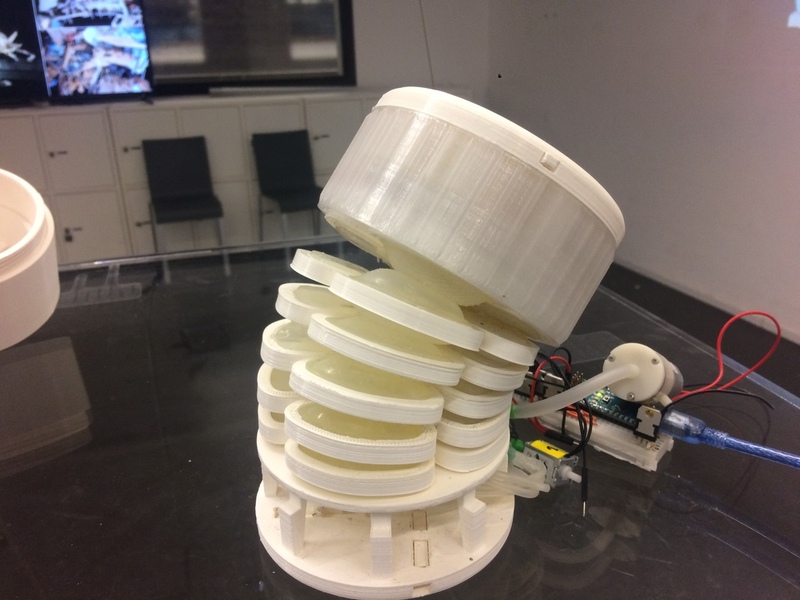 Revolving robot screws with special parts of the modular building unit. Also this revolving motion allows it to ride, because it works as a wheel. The casing is powered by stepper motor throw transmission and a circle toothed rack inside of the casing. Outside, the casing is covered by several protrusions. When the head of robot enters the hole in the module robot, protrusions are fitted to protrusions inside of a screw in the modular building unit. And by revolving its head this screwing system tightens and joins building units together. 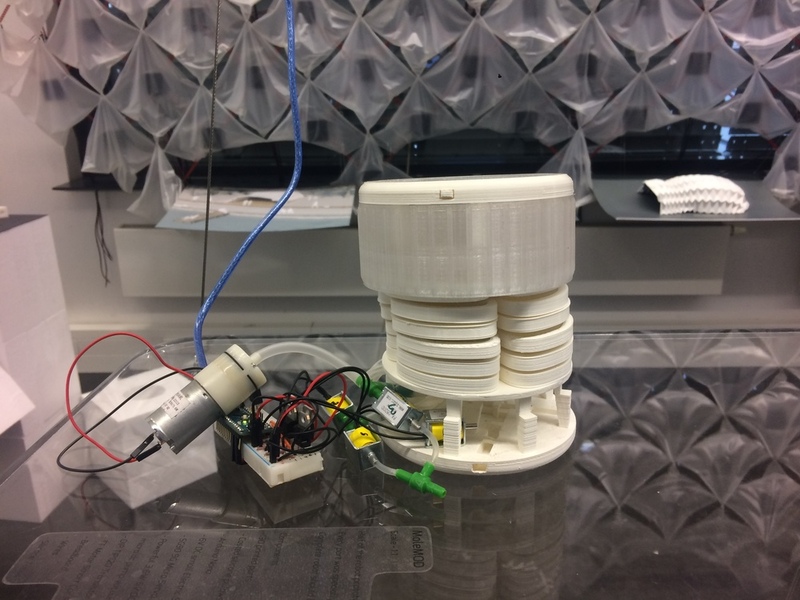 The Cover closes the robot head and prevents casing falling out of the circular bottom. This part is also used as a connecting segment to the soft body in the cover, which is screwed to the bottom part with a hole for wires. Latches prevent unwanted movement of circular bottom when the casing is screwing. Latches are normally retracted in the circular bottom and in the case of screwing are they extended to the holes in the modular building unit once this head is fitted and ready to screw. Latches are also important when the robot is crawling through the tunnels inside the modules, because they fit the head to side of the tunnel and the soft body can tighten the second head, where it is needed. The first prototype of the head was created entirely on a FFF 3D printer using the PLA plastic material. It is demountable and ready for future upgrades. The soft body joins both heads, it is very flexible and it allows control of the head’s direction. It is the main part for movement. The soft body is still in process and there are still many questions regarding technical details. Currently the soft body is split by rotator to two identical pieces. Each of these pieces has three “vertebra” and between them there are soft silicone pillows. By inflation or deflation these pillows are able to inflect, stretch or attract the whole body according to need. 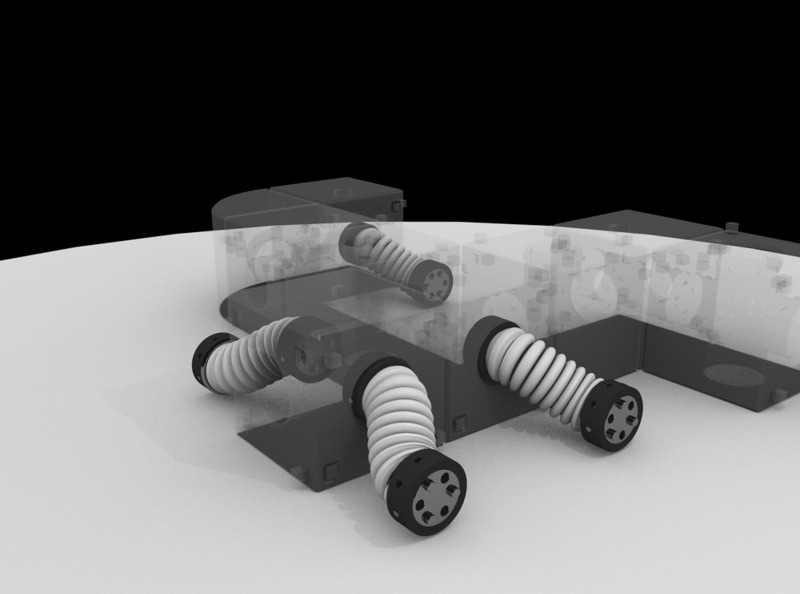 The rotator joins both soft bodies and is able to rotate with them, this part is only used for rotating with units connected to robots. This part consists of two circles and a servo motor which rotates the first circle opposite to the second one. The final building consists not of robots but the modular building units. These units are like bricks, but they are able to be moved and adapted by their symbiosis with robots. The robots are a tool like cranes, workers etc. which build houses and are ready to be used even after the completion of building. The big advantage of this system is that the units don’t need to have one shape. Units only need to have same faces, which are connected. It means that you can build shapes without large limitations. 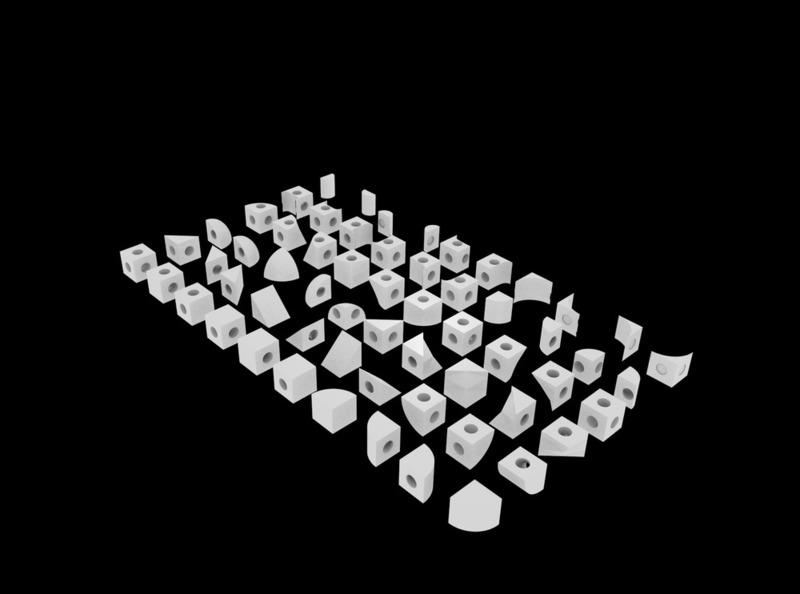 This system is based on cellular automaton “Wang tiles.” Units can have different shapes and numbers of tunnels but they should respect the modules, which are 300 x 300 x 300 mm, based on length of a normal brick. Each units has got one hole minimum, which usually leads through the units. In these holes and tunnels the robots operate and move with units by principles which are typical for MRS. The main task was to develop joints. Usually in MRS joints are magnetic or mechanical, but MoleMOD can´t work like that, because architecture and civil engineering require strong joints. For this reason special passage screws were developed which allow robots go through it, as well as tighten them. The next requirement was to develop joints which will be universal and which will not limit the composition of units. This means that there are no male and female joints but unisex joints. It offers many variations of connectivity. As was said before, a big advantage of this MRS is the variability of the units, which are not limited by mechanical and electronic components inside as is usual in other MRS. There is a need in place for operating robots. Thanks to that, the units are perforated and the final building is a big maze of tunnels where robots operate. A big advantage of this is that these holes can be used for piping, wiring or reinforcement as well as fixing to the ground by pile. Otherwise it’s very important to connect the units correctly. Because the faces are different, some of them have a hole for robots, and others can be flat or rounded etc. For this reason a system for composition will need to be developed. This system should be based on cellular automaton which will define the composition due to correctly connected faces of the neighbour units. For this I was thinking about the algorithm “Wang tiles”, which should help to compose the units. It is a tiling concept based on square dominoes with coloured edges, permitting their mutual assembly in a geometrically compatible (hard) manner. 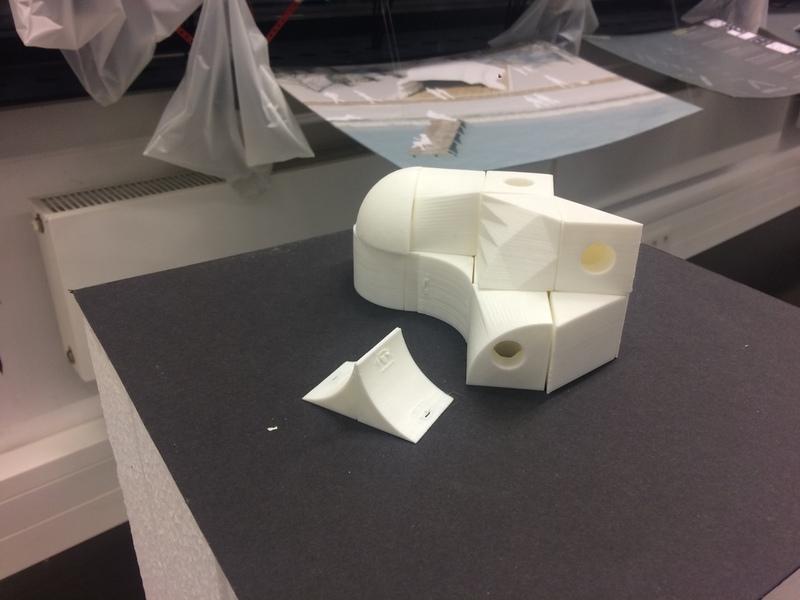 Though the MoleMOD focuses on future architecture which will be adaptive and movable. I would like to show several applications which could be used now. In the world there are still many locations where people can live but there is a problem to build (mountains deserts etc.) it is not only about houses but about bridges, pylons, polar stations, etc. These buildings could help people but they are not directly for normal housing. Use of MoleMOD gives a sense of security in places where there may be low safety of workers. Robots will be easily transported close to the building site, check the location, and start to build it using their bodies. Due to the fact that we talk about MRS, for robots it shouldn’t be a problem to build using robots and units, for example a crane, robotic arm, walking lorry etc. The system is open to different types of units which will not be a part of the building, like a gripper, wheel, sucker. Etc. It has similarities with hard to reach places. For the first buildings on Mars, it is important to consider the amount of material that will need to be transported from Earth, and that there is no guarantee of safety for the workers, who could build new buildings. For this reason it is good to think about autonomous systems which build what is needed. MoleMOD is able to operate there. The robots will be sent from earth and modules will be created there by a 3D printer from local materials. People today know that for some events it is not necessary to build massive and permanent structures. Sports events like The Olympic Games, markets, exhibitions etc. are used only for a few weeks or days. The Idea is to build tribunes, stands etc. automatically. For example: biathlon races are in other places every week in Europe and The US, you never know how many people will come, after each week tribunes need to be rebuilt, or there are tribunes which are not used per year. Why not use the autonomous robotic system, which will be ready to use before each race according to number of visitors, local conditions, etc. After each disaster there is a need to fix problems very quickly, for example after a nuclear disaster there is a need to prevent the release of radioactivity. There is no possibility to fix it by human hands because it is life threatening. One of the possibilities could be to build a sarcophagus from MoleMOD units. Another way is to build temporary dwellings for people affected by disaster. MoleMOD is at the start of development, in this article there are no technical details or control program. A control program will be one of the biggest challenges. It should be based on multi-agent systems, meaning that the robots will be autonomous. They should solve non-predictable situations, be ready for local conditions and fulfill the wishes of the client in the sense of Industry 4.0. MoleMOD is designed so that it shouldn’t limit architectural visions which share the opinion of the future, where houses, bridges, temporary structures etc. will be adaptive and movable. This is not new architecture, it is a new tool for better architecture, which works like bricks or panels but within current requirements. It good to know that this system is still basically MRS, but units are able to compose a lot of tools which could help during the building process as well as after building is finished. 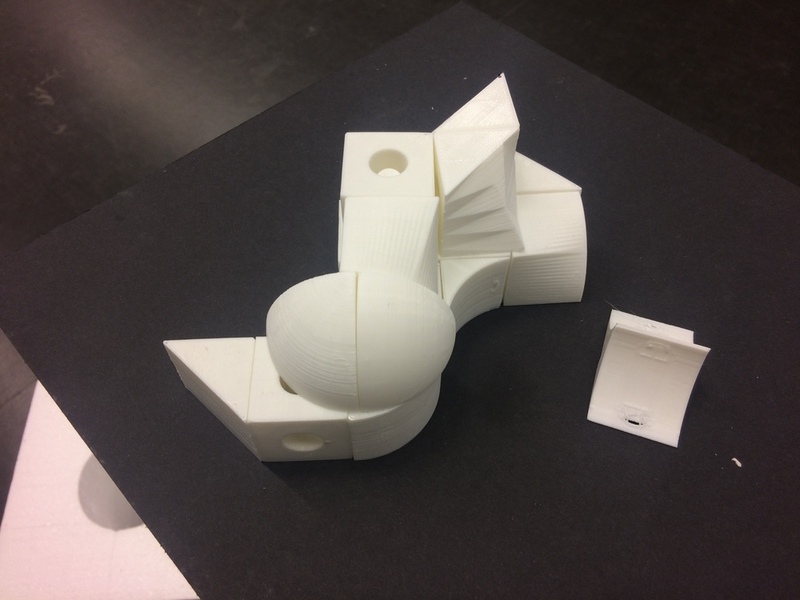 A building made of these components will be ready for adaptions and changes, which will be more frequent in the future. But even so, it is always needed to think about efficiency of investment. MoleMOD is trying to minimalize costs by splitting the system into active parts (robots), passive parts (modular units) and a number of more expensive robots on the client. A system with less robots will be only slower.